Installing a fence can be tricky, and the labor involved is almost always more than people expect it to be. A professional installation is the best way to be sure that your fence is installed properly, looks great, and will hold up over the years. Let the experts at First Class Fence & Access Control help you with your new fence installation today. 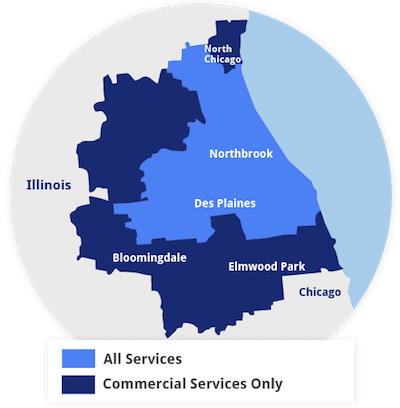 We work in Riverwoods, Glenview, Northbrook and surrounding Illinois areas. Call us at 1-844-485-8070 or click below to get a free estimate for your project! Pre-built panels always look great in the store, and in theory, they are easy to install. Unfortunately, they can actually be quite complicated in reality. The posts have to be laid out in exactly the right spot for the panels to be mounted because if the distance is too short or too long, the panels won’t line up and you’ll wind up having to dig more holes. Nobody wants to dig more holes after posts are being set and panels are going up. Let the expert fencing contractors at First Class Fence & Access Control install your new residential or commercial fence! Call us or fill out our online contact form for an on-site consultation and free quote today. We work in Highland Park, Glencoe, Deerfield, Highwood, Wheeling, Chicago, Lincolnshire and surrounding areas.